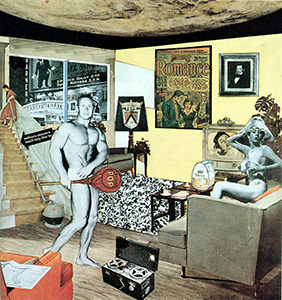 The beginning of Pop Art as an artistic movement is often pegged to the British artist Richard Hamilton’s 1956 collage Just What Is It that Makes Today’s Home’s So Different, So Appealing? so thats where I want to start our class today. What should be immediately apparent is that this piece looks nothing like the Abstract Expressionist work we studied last week. Instead of asking the viewer to stare for a long time to find meaning in the work, it tries to pop out and grab our attention. Instead of being about one artist’s personal hand, it is a collaged mixture of photographs taken from many sources. Instead of trying to reach deep and timeless truths about the human condition, it is irreverent and humorous and makes use of fashion and cultural references. So, what was it that makes these pop artists “So Different, So Appealing”"? Instead of slideshows this week, I’ve put together a collage of my own, of videos of artists talking about their own work. We start with a little background into the Black Mountain College, happenings, and the work of John Cage, a musician and composer who used chance to structure musical compositions. His piece 4’33″ is a performance where a pianist sits at a piano for four minutes and forty three seconds without playing anything. The background noise in the auditorium during that time is what he considers the music of the piece. Inspired by this work, early pop artists began to bring ideas such as chance and performance into the visual arts. We also look at our local fathers of Pop, Jasper Johns and Robert Rauschenberg. Both of these artists, whose careers began in New York in the 1950s, show us a style of work that breaks with many of the basic premises of Abstract Expressionism. Yet they also exhibit a quality of painterly expression, which shows they were paying attention to lessons learned in recent abstract painting. Now that you know a little about Greenberg and his drive to push every artistic medium back to is own roots, you can imagine that performance opened up possibilities for artists such as Rauschenberg and Johns. Possibilities which fit outside of the formalist, non-representational work that was receiving most of the attention. Contrary to Greenberg’s wish for each medium to be isolated, we see pieces with representation and narrative, paintings which are also sculptures, sculptures which also serve as backdrops for performance. Artists like Roy Lichtenstein also blur the boundary between artworks and comic books, and Claes Oldenburg shows us that even a BLT sandwich is a worthy subject for an artist. Often a distinction arises between the critical nature of British pop art, and the American Pop Art’s unapologetic embrace of consumer culture. But let’s not be too broad in this generalization, as the underlying unease we see in the Abstract Expressionists also shows up in pieces like the giant F-111 by James Rosenquist, which features a young child blissfully having her hair done at a beauty salon, while a nuclear mushroom cloud erupts in the background, or Andy Warhol’s pieces electric chairs and car accidents from his disaster series. By repeating an image over and over again, Warhol distances us from any emotional content of the image, and brings it into the realm of commercialism and mass production. Our reading this week focuses on Warhol’s use of machine-like repetition. Finally we look at Pop arts cousin, Super realism. The last videos present artists Chuck Close and Duane Hanson in their quest to make paintings that looks like photographs, and sculptures that look like they could move. We have seen two very different art styles now, Abstract Expressionist and Pop art. There is no right answer to this question, but I’m curious to hear about what you observe and how you guys feel: Do you think the art you see being made today is more like AbEx or more like Pop? Give an example. You can pull from whatever it is you see in your life that you think of as art. As one student asked, “What we see on a daily basis (school, work, travels) , museums, the internet?” To all of these, Yes. I think what we see today constitutes more as pop art. I think artist in todays society are more interesting in trying to create something that people can relate to. When artists tend to concentrate on things that people can relate to it makes a person feel more connected with that specific piece of art work, which then gives more meaning and insight when speaking about the piece. Johns said he concentrated on “things the mind already knows.”(142) Flag on Orange Field, 1957 is an excellent example of something that could be confused as abstract art, but because of the techniques used to create it such as the layers of newspaper and wax, but John’s was actually focusing on the American Flag, which has a different meaning to everyone as well as a unified meaning as a country. In today’s society I consider art to be many different things, but the main time I experience art, is when I am listening to the radio. Most of the time the songs that you hear on the radio are songs that are made so you can relate to them. So one can hear that song and then compare it someway to how they are feeling in a certain situation. Which is exactly what John’s did, he used normal everyday things such as numbers. I think art in today’s society is definitely more pop than abstract. i think the fact that you brought up music as an art from today was a wonderful idea. it’s true that music can be an art form and i would def. relate it more to pop art and AbEx. I agree that describing music as an art form is a really great perspective. But it goes even deeper than just the music itself. The Album Artwork, the music videos, the lighting and visuals on stage during live performances, theyre all art forms. Even down to the way artists dress when going to awards shows can be considered an art form. Wow! I never really thought of music in this way before, but you are right. Interesting and valid point. Now I’ll have to stop, think and really listen when I’m playing music. I agree with your post, however, I also believe that there are many pieces of abstract expressionist art work being created as well. I do believe though that in the next few years, pop art will become the main style of art work created. I agree with all of these statements, for music is an art form and most of the music being produced today would seem to fit into “pop art”. But the genre of electronic music and dance music can be interpreted as abstract sounds being fused together, for there are no lyrics to electronic/dance music, but “samples” are commonly used. These samples are snippets from other pieces of music, tv, the radio, speeches. These samples make this fusion of sounds an abstract piece, as opposed to say, Taylor Swift. You raise a good point here, musicians like Animal Collective use layers of overlapping sounds that often seem to clash against each other, like the brush strokes in a de Kooning. And musicians such as Sufjan Stevens can display much of the existential angst we saw driving the AbExers, as he displays in this interview. I also agree with you when you say that music is more pop art at least in todays society. A majority of the time the meaning stands out and you are really able to know what the singer is trying to express about whether it be a break-up or a love song. Music is where I tend to see that pop art really exists. I also can see that abstract art still exists because sometimes there are pieces that have two meanings, the one on top and the one underneath that you are left to search for. Music is art from pop to abstract especially in todays world. Music artist are always looking for the new thing to catch the eye of todays youth. Music use broken language (chopped and screwed) making a song abstract but still keep the interest of the people listening to the song. So music comes in many different forms to reach out to people just like a painting. Obviously the biggest difference between music and the visual arts is that you see one and hear the other. Because of this I think there can be good songs to listen to despite the fact that a song’s lyrics might not have a deeper meaning. The best songs in my opinion have meaning, but a song can still be good with no meaning, but with a good beat and melody. Art that pops is nice, but it cannot hold one’s attention like a song can because it doesn’t last for a set period of time, and does not have a melody. But art can still have rhythm by guiding the viewers eyes similarly to how music can guides ones ears in a sense. Art that pops catches my attention, but art that has a deeper meaning and a story keeps my attention so that is why I believe elements of both are important. I think the art being made today is more pop art. I believe this because like you have said in the introduction, todays art jumps out at us instead of having to search for a meaning. I can find pop art especially in my music for example listening to any Taylor Swift song I can almost instantly put a meaning to it that represents me and something I have gone through. Also when watching tv I sometimes find that the episodes relate to what I might be going through at that time. I like that I get to see how others are dealing with their problems. For example the Oh Alright painting by Roy Lichtenstein is a great example of pop art because you can instantly see and realize how the women in this painting feels, let down. Although many people were shocked by this new type of art, it soon became familiar and has yet to go away. I think Taylor Swift is an excellent artist to discribe Pop Art, because her lyrics are very to the point. An example would be her newest single “We are never ever getting back together” I don’t think that one can get more to the point than that. Also I think reality TV also has a huge impact on the ability for most of us to be able to relate, since it is not “scripted” for the most part. Taylor swift is a great example to define and portray pop however when reading this comment it made me thing of lady gaga. My only question that I wonder now is, do these artists really mean art? Or are they just creating a whole new trend that they want to be considered art? Here’s an article talking about Lady Gaga’s obsession with Andy Warhol. In her case, I think she is constantly looking at what worked well as pop art in the past (Warhol, Madonna) and trying to rework it into something new. I think that your describing of pop art by using Taylor Swift was good. She’s always getting the the point and always telling how she feels exactly in each song she writes. To us now a days, pop art should mean that it should definitely ‘pop.’ to our attention. I feel like music is a great art form, too. People often forget to look at it that way. Taylor Swift is a great example- she really just puts it all out there, doesn’t she? You can almost always relate to her songs. Once you said that Taylor Swift was an example, it made me realize that any music can be art. If it jumps out of you and you don’t have to search meaning, the lyrics are art. I believe that art is being more made like pop art today. To me it seems that in most cases, art today has a lot to do with the process that one goes through that makes it art which was seen in many of the pop artists. for example Tom Friedman’s “1,000 Hours of Staring” consists simply of stares on paper and is all about the process it took to stare at the paper for 1,000 hours. This reminds me a lot of Robert Rauschenburg’s Erased De Kooning. Reuschenburg’s piece was about the process it took to erase a great work of art that was very difficult to erase and took about a month to complete. Another example that relates to pop art is a blog I check out sometimes called thingsorganizedneatly where people put up photos drawings ect. of everyday objects organized neatly. This remaindes me a lot of all the pop artists mentioned because they made art out of everyday things that people see everyday and can relate to. your comment about how its a lot about the process that one goes through reminds me a lot about Benjamins article the work of art in the age of mechanical reproduction. in the article, he goes on about the “aura” of the paintings, and how when you have a painting and it becomes reproduced say, as a poster, you lose part of its magnificence. it loses its aura in his terms. with the 1000 hours, it would be like just reprinting it and handing it out… all those printed images, lose the whole 1000 hours of staring because why? because we all know that the artist is not going to do that to all 15,000 copies that were made. Don’t you think that the two works you cited are really designed by the artists to make fun of an audience that would accept the absence of work to also be art. These ‘works’, the production of no work, is very satirical in their nature. Are they mocking the current definition of art by pushing the envelope as to art’s very definition? If the public accepts their expanded definition of what art is, do they not then produce more outrageous examples of art to try to find the limits of its definition? In the case of Tom Friedman, I don’t think that he is satirical. I’m guessing he genuinely stared at the piece of paper for 1000 hours. But I say this only because the rest of his work is equally obsessive and meticulous. Take a look at the cereal box on this page which is made of a bunch of real Total cereal boxes cut up and glued together, or star shaped sculpture on the bottom, made out of thousands of toothpicks. If I didn’t know his work, I might believe the blank paper was a joke on the viewers, since there is a lot of cynical art out there these days. It is interesting that you bring up Benjamin in the context of Friedman, because in some ways he is actually doing to opposite of Benjamin’s claims on reproduction. Benjamin says the mechanical reproduction lessons the meaning of an object ( and notice how Warhol’s uses this idea when he takes a powerful image like an electric chair or a race riot and reproduces it over and over until it looses its impact). Friedman takes something reproduced that has little meaning of it’s own — a cereal box, a toothpick, a piece of paper — and then gives it meaning by adding thousands of them together or by adding a thousand human hours of labor into the object. I would be curious how you all think a project like Ai Wei Wei’s Sunflower Seeds fits into this discussion. We will be looking his work in the second half of the semester. I agree that AbEx art is not extinct. I do still see the existence of this form of art, although I feel it is not as popular and not as relevant as a modern version of Pop Art. I agree completely with you. Pop art is becoming the main art style now, however we do still see pieces of abstract art being made and displayed in museums. Pop art is a lot simpler to look at and makes understanding what the artist is trying to convey that much easier. I think that is a great way to put it, pop art is “a lot simpler to look at”. People spend an average of about 3 seconds looking at an art piece in a museum today, so artists are making pop art which is easy for society to understand and distinguish what it is. Abstract art is still see but people don’t understand the process of how abstract art is made (the story behind the piece). (As covered in many other posts) Music is a great way to bring art to people who simply dont have the time to sit in front of a canvas, sculpture, ect, and appreciate it. You listen to it when you drive, when you work, all the time no matter where you are. I believe that in today’s society both pop art and abstract expressionism are still used throughout everyday. The art we mostly see though is things that are fully alive with color and even detail that we can understand and even sometimes relate to. I see too that pop is mostly used more because it’s something that just shows itself more clearly than abstract expressionism. We see it right in front of us; there could be a story behind or a meaning but sometimes it just speaks for itself clear enough. So I’m guessing I have to side with on pop art more, but to be honest I think both types are here strongly equally. The art that I look at today is art like the words behind lyrics I listen to and picture a scene that works with it, or even the pictures from other artists I admire. Like a picture with people showing happiness or sadness; it just seems to pop out of the image for me without explaining why. i can definitely say that i lean more towards pop art i just feel like i can relate to it better. though i still find AbEx to be interesting. I see what you mean by pop art having a direct meaning being easy to relate to, but I believe that it’s better to relate to abstract expressionism because it has a deeper meaning. Also pop art can sometimes be on the borderline between having a direct meaning and being shallow. In areas such as graphic design (which is seen everywhere in today’s society) it is better to have a direct meaning because the goal is to visually communicate a direct message. Usually the message is something positive to make a customer want to purchase a product. Even though art involves design, what separates art from design for me, besides not being about advertising, is that art has more freedom in not having to communicate a direct message and because it lets you ask why. I believe that art today has a huge part to deal with pop. Artists today tend to create art off their daily doings of feelings and emotions. We have talented, creative artist/singer Pink whom creates her style off her music. Also, I believe pop has a really big influence because today alot of people tend to relate to music when they need to express themselves instead of composing an art piece of abstract expressions. http://www.crayonfire.co.uk/ gives me the same feeling as that of Rosenquist’s F-111. And even for those who are not real artists, how many can not resist the attraction of “Warholizing” a photograph of themselves through one of the many digital art tools available today? This is true. A lot of pieces are making a comeback through digital art. Even on the computer today, “”Warholizing”" oneself is possible. I think in this age, people get nostalgic for what they thought of as the “good old days” and want to be taken back to that time and see more of what they knew. Digital art makes it come to life even more. Although, some kids may not understand the where and how it all started, they are still fascinated with it. My major is graphic arts/advertising, and I’ve noticed that pop art is replicated through the computer screen in digital art. Even though the same process isn’t used, many digital artists like the look and feel of pop art so they try to make their own. I think art today is a combination of both pop and abstract. Looking at museum pieces and sculpture gardens there seem to be more abstract than pop art pieces. However, viewing the work of younger artists they seem to create more pop into their work. By including “..brightly colored, upbeat, clean and fun, in direct contrast to the ‘dirty’ and ‘disgusting’ stuff…” they can draw a younger and more hip crowd. It visually pleasing with the colors and I think it’s easier to understand. Visiting the Art gallery at Mercer I can usually see a combination of both. I agree that today’s take on art is both pop and abstract art. I think it was interesting to how you described the way pop art was and I couldn’t say it better myself. For this generation everything is mostly about color and making our attention drawn to each piece of work. I agree that both abstract and pop art are seen today, but pop art is seen more. I also, agree that the colors used in pop art really catch people’s attention. People also gravitate to a more pop art style because it is easier to understand and the purpose of the art is straight to the point. The art being made today is most like abstract expressionist. I remember going to the Metropolitan Museum of Art in New York and noticed that many of the art works I saw were very abstract. I remember seeing one piece of art that was extremely abstract. It was a painting that showed a woman’s face being distorted and the only thing you could really tell was the emotion being expressed on her face. If I remember correctly, the woman’s face had an almost lifeless, dull expression to it. I agree with you when you state that pop art is more exciting for a younger crowd, it draws them in with colors and a meaning that usually stands out. You make a good point stating that abstract and pop are both in todays society, I really had not noticed. I think its good that both are still important because they can draw in two very different types of people and cause them to love art. There are those who love to think about art deeply and really search for the meaning while there are people who love that the meaning just stands out to them. I feel that today’s art resembles both pop art and abstract expressionism. Current artists have so many great pop art and AbEx artists to look back on for inspiration; however, I do feel that pop art is more common to see. A lot of art now is digital, and from that we get these really abstract, geometric, random pieces, as well as pieces that resemble pop art, with their bright colors and very “in your face” designs that don’t require you to search for their meanings. I think where you are (NYC, grounds for sculpture, a museum) can show you great, different examples of both types of art. I feel that pop art is used more today than AbEx. I’m not sure if it’s because I like pop art better, so I notice it more or what. I see pop art from the music I listen too, especially country artists because they usually get right to the point and say how they really feel. Also, being a Graphic Design major, I feel like what people make resembles pop art. I like the feeling pop art gives you. It just gets you thinking that maybe one day you could make art as good as Andy Warhol and learn from his techniques. I never really thought about the fact that I think pop art more so that why i notice it more, but that makes a really good point. I think it’s very true, when you like something you start to notice more and more than something you really don’t care about. I also think the example of county artist’s is extremely true, considering most, not all, are songs about heartache. Pop art is all around us today but ifyou look closely at some pop art you can see abstract techniques in them. Over time you see the past resurfs with some things and techniques. So when looking around you can see a little of both kinds of art pop and abstract. 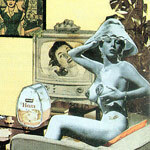 I agree that POP art is seen more then AbEx its in our music used in our comerceal ads on tv and bill boards. Pop art expresses what is happing in the world around us. In today’s world there are so many different opinions on just about everything. There are different viewpoints in every instance of life. Examples where different viewpoints excel include: religion, sexual preference, musical interests, science, technology, and human existence in existence. Within the art world I see a mix of pop and abstract. Many artists combine the two to express multiple things. But abstract is the heart of it all because there are many things that don’t seem to be what you look at; at first sight. In my opinion pop and abstract in this age in time are one and the same. It is possible that both pop and abstract art are one and the same… However, how can you relate something that can be very difficult to make sense of and which is base on the artist’s feelings with something that is very conspicuous and bold? With the broadening of the term ‘art’, multiple styles have merged from multiple media. What was considered commercial is now also recognized as ‘art’. So, advertisements for products and events in the form of posters are examples how commerce has moved over into the arts. The advent of digital drafting, images and cinema allows illustrators to combine these media into more effective advertisements. Art today can almost be anything, from the more traditional art forms of painting and sculpture along with drawing to the more bizarre. Today more modern and controversial art exists like that of Robert Rauschenberg who even uses a goat as the subject, or the art of Claes Oldenburg who makes even a BLT sandwich into the subject of artwork. Though some art we may not agree with, today modern art seems to test what we know about art and tries to make us re-evaluate what is art. A lot of today’s art is about finding one’s own unique style, or just doing something new that has not been done before. I believe that the majority of today’s art is more like abstract expressionism over pop art because while pop art is in fact a modern form of art, abstract expressionism can be taken more seriously. When I look at John De Andrea’s art it holds my interest because it clearly communicates an emotion and makes one think about what his lifelike figures are doing. But to debate abstract expressionism versus pop art is like arguing deeper meaning versus attention grabbing and serious versus humorous. Humorous art can be art too as it makes one feel an emotion but the viewer’s reaction is different. Art for me has always been more powerful if it has a deeper meaning and makes one think. I also believe that what art is like today depends on what one likes about art because people tend to notice what they like and disregard what they don’t like (like if one didn’t like pop art versus abstract expressionism.) Though generally I prefer abstract expressionism, I like pop art as well and I believe that elements of both can be combined. Good art to me should make one think, but if it doesn’t initially pop out and catch the viewer’s attention then it is harder to hold the viewers attention and make them think because they may just disregard it altogether. I believe that that art we typically see today is a combination of both abstract art and pop art. However, I believe that pop art is seen more than abstract art. The purpose of a lot of art today, in my opinion, is to catch peoples attention or to make a bold,memorable statement,like pop art. A lot of clothing we see today is very similar to pop art. A lot of bold, bright colors and designs are in style. I believe that both styles of art are seen today, but pop art is seen more. To Sum up Pop Art is the one most used around us. You created a great point in saying that both styles are seen today but that pop art is used more in commercials and advertising. Pop art is bold and stands outs and really grabs people attention. So, when people create advertisements, they want to use something that is simple but bold and memorable which is why pop art is seen a lot in advertising. One way that I see Abstract Expressionism and Pop Art colliding is the murals around Trenton. They’re abstract but there aspects of the murals that are familiar and show emotions. In todays society I believe art is more based around pop art than abstract expressionism . Pop art, which many people discovered through Andy Warhol, is seen in paintings to this day. Pop art has expanded though, it is common to see pop art printed onto tee shirts, and Apple laptops have an effect on the webcam in which someone can take a photo of themselves with a pop art effect. This effect create four identical photos and makes them different hues from each other. The bright and bold colors are also much more appealing to the eye when pop art is used for advertising and other works. Abstract expressionism is still an art form but I feel it has not made it out of the gallery. Abstract art pieces are rarely seen outside of a gallery, such as used in an advertisement. Abstract expressionism is more common in museums, such as Jason Pollocks work, which would most likely never be seen on a billboard for an ad. I agree, the fact that our modern world has created “features” rendering Pop Art ( Andy Warhol-esce feature on an Apple laptop )proves that this style has had a tremendous influence on our society today. I believe that a lot of the art we see today is pop art. You can see it everywhere now, many girls get pop art pictures on there nails, lots of singers use it in there posters or cover art for there cd’s, you can even get an app on your phone ipod or computer to take a picture and turn it in to pop art. Pop art is a wonderful way for people to be able to express themselves in a fun colorful way even if the picture they are portraying may not be the happiest we can still feel there emotion but in a brighter way. though some people may feel differently there is no denying that pop art can be found anywhere today. You are absolutely right about females incorporating pop art in their nail designs. I did not even recognize it! Well, from most comments I have read… I can say that Pop art is almost everywhere… Music, any kind of designs( shoes, bracelets, dresses, nails,etc…) advertising, commercials.. and I realized that it is a great manner to express our creativity. That is so true! You would never think Pop Art would have such a huge influence still present till this day! I believe we see more pop art than abstract expressionism. When I look around me, I see graphic T-shirts, memes on the internet and murals dispersed throughout certain cities. Although the murals are abstract at times, one can still recognize everyday items that the human experience would be familiar with. We both can agree that we see more pop art that abstract expressionism these days. Graphic T-shirts are a great example of this and a lot of posters and logos display this quality as well. They are very familiar and easily recognizable. Today’s artists seem to have embraced the spirit of the modernists in that they “do” what they want to do with no restrictions, “Art for the sake of Art”. I don’t see any trend today other than there are many expressions of style of past trends. The Pop artists were attempting to comment on the commercialization of American society but became commercialized themselves. It was almost as if their own commercial successes were an added mockery on the commercialism they mocked. I think current artists are more serious in their work than the Pop artists and will once again portray humanity in its many varied forms, in many varied styles. I agree most artst today do what every they want and call it art, But I do see more pop art and topical issure of the day. I’ve also noticed that many artists in this day and age tend to do whatever they feel and appreciate it for what it. There isn’t really a dominant style or trend but the artists will continue to create art in their own unique ways and various forms. Abstract expressionist comes from one self. Pop counter movement you have to remove yourself. Most of what we see today is more of Pop art it deals with more topical issues of the day, such as the war, abortions and Homelessness. From Princeton to Trenton we are entertained by different styles of art work, as you walk around Princeton you get more of a mix of Abstract Expressionism and some pop. As you drive past the Hamilton train station you see a more pop. Examples; the Big tooth, the little girl ridding with her dad on her bike the man reading the paper in front of the Justice Hues complex in down to town Trenton. The grounds for sculpture is another place that I find all types of artistic styles but I see more of a pop influence. In NY I find that the Moma is more of both but the Metropolitan museum of art has more of Abstract expressionist. The Googanhim is more pop. what I have found for myself that each type of art still is the same but moves indiferent fases as the world changes the same goes for music.Through art and music we are able to express what is happening around us. kind of like historical documents. Abstract Expressionism and Pop Art are easy to see in everyday life. For example, when you walk into Target to buy a piece of “artwork” to decorate your house, you tend to find different color field pictures. Simple framed pictures with blue, green or purple squares that give off a serene mood. However, if you head over to the children’s posters section, you will find pop art, i.e., Spiderman, Batman, Princes and Princesses. It’s similar in IKEA where many of the pictures people buy are abstract or color field pieces. Among other black and white photos, you can also buy enlarged pictures of Marilyn Monroe. This is an example of pop art. In everyday life, you can also catch examples of Abstract Expressionism and Pop Art through graffiti on the walls and sidewalks of the city. What about Facebook and Pinterest? Do they offer examples of Pop Art? When looking at examples of pop art by Roy Lichtenstein and Eduardo Paolozzi, their art reflects comic strips and magazines. This, to me, turned art into commentary. In Paolozzi’s “I Was A Rich Man’s Plaything,” the “pop” sound comes out of the gun in a commentary bubble. This piece of art includes found objects to represent American culture during that time. Today, we can see examples of American culture through the use of the internet. For example, how many times have you liked, shared, or repinned memes on Facebook or Pinterest?. I see a meme and laugh at it, re-pin it, share it, etc. Meme’s reflect the humor of our generation and therefore, American culture. It’s interesting when you begin to question if they are pieces of art. Do you think that they are?